A few thoughts about this past week's terrorist massacre in Mumbai, India. First, a heartfelt praise. A long-time friend of mine who is a pilot with Delta Airlines was in Mumbai last week, and in fact was staying at the Taj Hotel. He was away from the hotel when the terrorists attacked. He was kept in safe custody by the police and put on a plane home Friday. He lost all his things back at the hotel, but not his life. I thank God for his deliverance as I pray for the souls and the families of those who were not so fortunate. What we witnessed this past week literally looked like a scene from a Hollywood film or TV police drama -- a small group of well-trained and well-armed terrorists, coordinating their attacks and communicating with one another via satellite phones and GPS devices, attacks a large number of targets throughout the city of Mumbai, throwing the city's emergency response services into a state of chaos. They take hostages, they torture and kill, they set off bombs and start fires. Then they converge on their main target, the Taj Mahal Palace Hotel, killing dozens, taking hostages and torturing them, and planting bombs in an effort to implode the hotel and kill everyone inside, including themselves. Despite the great loss of life it was in the end, as Instapundit noted, an "epic fail," with a final body count between 5% - 10% of the 5000 deaths that they originally planned. You're sitting in some distant foreign capital but you're of a mind to pull off a Mumbai-style operation in, say, Amsterdam or Manchester or Toronto. Where would you start? Easy. You know the radical mosques, and the other ideological front organizations. You've already made landfall. It's missing the point to get into debates about whether this is the "Deccan Mujahideen" or the ISI or al-Qaida or Lashkar-e-Taiba. That's a reductive argument. It could be all or none of them. The ideology has been so successfully seeded around the world that nobody needs a memo from corporate HQ to act: There are so many of these subgroups and individuals that they intersect across the planet in a million different ways. It's not the Cold War, with a small network of deep sleepers being directly controlled by Moscow. There are no membership cards, only an ideology. That's what has radicalized hitherto moderate Muslim communities from Indonesia to the central Asian 'stans to Yorkshire, and co-opted what started out as more or less conventional nationalist struggles in the Caucasus and the Balkans into mere tentacles of the global jihad. As I have written before, the ideology that drives these attacks is based on a corrupted version of Islam. Young men (and now apparently women) are exposed to elements of this ideology from birth, and when they reach a certain age they immersed in it. These young people (like all intelligent young people) know that something is wrong with the world, but instead of being encouraged to explore and learn and ask questions, they are brainwashed into the cult of radical, violent Islam. They are taught to ignore their own obvious cultural and societal shortcomings, and to instead believe that their problems are solely the result of Allah's wrath. His rage burns because His people have abandoned the teachings of the Koran, and have instead polluted themselves by accommodating the sinfulness of Western infidels and Jews. Allah must be shown that a new generation of Muslims is committed to restoring holiness to the ummah, and the only way to do this is to slaughter infidels, Jews, and apostate Muslims, so that their blood can atone for the sins of all Muslims and persuade Allah to once again bless His people. This bloody ideology, as Mark Steyn notes, has spread throughout the world. Its adherents are linked simply by a shared body of literature and teachings. Local organizations abound, some with international links, but there is no "central command." Each group has its own leaders, but their members freely travel from one nation to another, from one group to another, keeping the movement alive and making attempts to quash it increasingly more difficult. It is this elusive aspect that gives the movement such an ethereal and spiritual quality, and allows religious leaders to characterize it as a manifestation of the will of Allah. In many ways radical Islam resembles the Marxist idealism that spread throughout the world following the Second World War. However, that idealism almost immediately manifested itself in a series of full-scale violent revolutions, as Marxist forces overthrew governments and created Communist states. Most of those governments ended in failure; those that took decades to fail provided a hard target for Western foreign policy and military operations. Also, the appeal of Marxism varied greatly; it only attracted a substantial following in poor, post-colonial nations. In nations brutalized by Communist governments, it is extremely unlikely that Marxism will ever again become a mainstream movement. In America and other Western nations, Marxist agitators from the 1960's quietly slipped into the mainstream of society, assuming university professorships or becoming civil rights advocates. They no longer pose an existential threat, but their ideas continue to influence younger generations. Radical Islamists, on the other hand, have been very careful to build their movement in the shadows, in the privacy of mosques and madrassahs. They have also been very careful to firmly link radical Islam with suffering at the hands of the wealthy and the powerful -- and the Jew. By continually reinforcing this critical link with Marxist thinking, they have gained the sympathy of Western journalists and academics, who have unwittingly become some of their most powerful and influential allies. This link has been established so thoroughly with respect to the Palestinian people that even the most open displays of radical Islamic bloodlust are almost universally greeted by Western journalists with heartfelt sympathy and pleas for an end to Zionist oppression. Most radical Islamists have also been very careful not to openly or directly associate themselves with governments or nation-states. After 9/11, the two most prominent state sponsors of terrorism, the Taliban in Afghanistan and the Baathists in Iraq, were wiped out by Allied military. Libya gave up its nuclear program and pledged full cooperation with the West. The Pakistanis and Saudis also decided that being linked to terrorists was a bad idea. And when Al-Qaeda forces made the tactical blunder of concentrating their numbers in Iraq, they were summarily decimated by Allied and Iraqi fighters. Of the last remaining terrorist strongholds, Somalia is a shambles and is primarily controlled by a loose confederation of belligerent tribal leaders. And Iran is a curious case, a nation governed by an extremely clever Islamic regime that has cleverly positioned itself as both a supporter of the oppressed Palestinians, and a victim of imperialist American aggression, thus avoiding condemnation from the West at large. Iran is also the only Islamist nation that has inflicted a significant defeat upon the United States military. So what are we left with, those of us in the cross-hairs of radical Islamists? Certainly not conventional warfare. Although we learned many lessons about guerrilla warfare in Vietnam, and although we have enlisted the invaluable aid of Israelis, who have been combating radical Islamists for decades, there is no way to mount a full-scale military assault against a shadowy enemy who is fully integrated into the world's civilian populations. We also suffer from a completely misguided urge to treat terrorism as a crime. It isn't -- as I explained above. Our overly sensitive, politically correct news media has been so besieged by people claiming to be victims of injustice that they cannot bring themselves to stop using the words "alleged" or "suspected" unless a perpetrator has been warranted, surveyed, arrested, indicted, tried, convicted, and finally denied an appeal. Terrorists know this. The tasteless exploitation perfected by "Paliwood" is sufficient proof of how easily our news media can be manipulated. Captured training manuals instruct terrorists to claim mistreatment and torture at the hands of their captors, in order to gain sympathy from the media. Reports of the Mumbai massacre included detailed accounts of armed policemen refusing to shoot the terrorists, even when some of them had ample opportunities for clear shots. Some policemen reportedly hid, fearing for their lives. It's hard to say why this happened; certainly some situations would have provided the police with a good opportunity to neutralize the attackers, while others would not. But undoubtedly many police simply did not know when it was acceptable to use deadly force. Terrorists know this too, and they will not hesitate to take full advantage of it. The pirates currently menacing the waters off the coast of Africa know it as well. Of course piracy is a crime, an illegal enterprise that is nothing more than glorified theft. The pirates know that we in the West abhor violence and death, and that we will pay anything or do anything to avoid bloodshed. These things simply make their ends much easier to meet. Some nations have been forced to put aside the West's aversion to killing in order to ensure their own survival. Israel has learned the hard way that they must stop terrorists, even if they are forced to inflict casualties among the innocents that terrorists deliberately use as human shields. Naturally Israel is condemned for such actions, but Israel knows, without any doubt, that no other nation is going to actually try to stop them -- because such an effort would itself involve violence. But the flip side of such defiance is that Israel also knows that few nations -- perhaps only the United States and Great Britain -- would ever shed the blood of their own sons and daughters in order to defend them. So it seems that we are left with two rather imperfect solutions, each involving a non-trivial margin of error. First, we should not turn our world into a police state that spies on all its inhabitants and routinely jails people on the flimsiest of suspicions or complaints. But we should understand that all civilized nations allow for the surveillance and detention of suspects for a good reason -- our own safety. When we allow collective guilt to overtake common sense, and we begin to treat criminals or suspected terrorists as victims and law enforcement officials as criminals, then we have compromised our best non-violent security system and rendered it virtually useless. Likewise, saber-rattling, massive buildups of offensive weaponry, and routine or heavy-handed use of aggression, violence, destruction, and killing are all examples of completely unacceptable behavior. America and her allies should not be "enforcers," figuratively breaking kneecaps around the world whenever we feel threatened. But we should realize that there are some situations, like the Mumbai massacre, where the use of deadly force is not an over-reaction or a crime against humanity, but a necessary course of action that will ultimately -- in spite of its temporary pain -- save far more lives than it takes. We cannot force an end to any ideology, so long as its proponents succeed in convincing the gullible that they are victims of surreptitious conspiracies. But we can protect ourselves from its followers. Arthur told of the moment he and his comrades were paraded on TV and forced to confess they had strayed into Iranian waters. He said: "A guard was saying, 'smile, smile, smile for camera'. We felt it would help if we obliged. "We were happy to see each other for the first time. But the genuine smiles lasted just minutes." The article also tells us that Seaman Faye Turney's nickname aboard ship was "Topsy." Gotta love those Brits. Arthur said: "I missed Topsy most of all. I really love her, as a mum and a big sister. Not seeing her and not knowing if she was safe was one of the hardest parts of the whole thing. "Then on the sixth day, when I was just about giving up hope, I was pulled from my bed in the early hours of the morning. "They led me down a corridor and into a room, where I saw Topsy in a corner. "I can't describe how that felt...just every emotion rolled into one. I ran up to her, threw my arms round her and cried like a baby. "When I'd calmed down, she asked, 'Do you need another hug, a mother hug?' and I said, 'damn right'. She was just as pleased to see me because they'd told her I'd been sent home. "Topsy said she'd always be there for me, to protect me and look after me. I don't particularly object to the platonic, almost motherly love that Batchelor had for Faye Turney. I just don't like seeing it in the military. These kinds of relationships among shipmates (or among any troops) break down the discipline and command structure that is essential for the military to function properly. And as for the complaints about the sailors and marines receiving compensation for telling their stories, well, welcome to the 21st century, where everything is for sale. Faye replied: “No I most certainly have not”. Taken aback by her forthright response, Ahmadinejad was momentarily lost for words. Red-faced, he then muttered: “Er, well, good luck in your life and your future”. And with that he nervously signalled to flunkies to move Faye on so he could meet the next hostage. "Such a drastic and irresponsible step should remove any lingering doubt that the Democrats' political strategy is to ensure that there is an American defeat in Iraq, in order to ensure their own political victory in 2008." Make no mistake. Grandmother Superior's self-serving trip to Syria has nothing to do with "checks and balances" or "congressional oversight." It is arrogance pure and simple, based upon an elitist notion that Democrats are to be the true rulers of America in perpetuity, with the occasional Republican power grab (always the result of deceit or trickery, mind you) simply an inconvenience that must be endured every so often. Read the rest of Thomas Sowell's article here. And let's not forget about Ted Kennedy, Jimmy Carter, and Tip O'Neil. 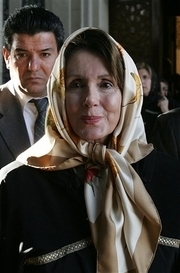 PS - Nancy Pelosi as a dhimmi. It's called foreshadowing, I believe. Actually I think the scarf looks rather smart. LGF has a couple more pics. UPDATE: Smackdown time! If both the Washington Post and USA Today disapprove of what a Democrat is doing, then they must be really doing something wrong. Remember Abdul Rahman, the Christian convert who fled Afghanistan and found safety in Italy after Muslim mobs demanded he be killed for abandoning Islam? Well, while the rest of the world has forgotten about Rahman, the sharia-embracers and Koran-thumpers who believe all apostates should be murdered have not forgotten Rahman's "insult." They've kidnapped an Italian journalist and are demanding that Rahman be handed over to them in exchange for the journalist's life. "Truth to power" time here, folks. Mohammed's command to kill those who abandon Islam is taken literally by radical Muslim jihadists, despite what the politically correct hand-wringers in the West say. Pray for Rahman and for the safe release of the innocent journalist who might be killed if the bloodlust of the radical jihadists is not eventually satisfied by killing Rahman. In the wake of the death threats and rioting that ensued as a result of last week's university lecture by Pope Benedict XVI, there has been quite a bit of good blog writing on the subjects of Islam, Christianity, and holy war. Blogging at Brutally Honest, Tim Chesterton penned a good explanation of the pacifist tradition within Christianity. I think it's pretty accurate. This appears to be the first in a series of posts that will discuss non-violent and violent responses to evil, so mark this blog and check out the rest of the series. By contrast, the Islamic Suras quoted by Robert Spencer and others that promote violence by Muslims against non-Muslims come from the second half of the Koran. They have not been abrogated by later scripture, because there is no later scripture. Spencer’s argument is that if any Koranic verses have abrogated any others, then the weight has to be given to the later verses–and they’re the violent ones. But if you don’t understand the principle of abrogation or the fact that not all scriptures hold equal weight in any faith, and it’s clear those who don’t hold to any faith at all probably don’t since they keep quoting Old Testament civil Law to slam Christians, then you’re ill-equipped to make the distinctions that mark Leviticus less authoritative on behavior than the Gospels for the Christian, and earlier verses less authoritative than later ones for the Muslim. The position of the violent Suras in the Koran is both a fact and a problem, one Spencer attempts to engage on its own terms, and one secularists consistently misunderstand because they don’t understand how a given text relates to a given faith and to other texts within that faith. I am not versed enough in the Koran to make judgements as to whether or not the violence and warfare endorsed by the teachers of radical Islam indeed stems from a general understanding of the Koran shared by average Muslims. But Preston's piece seems to outline a reasonable argument as to why this could be so. In response, Robert Spencer himself added more to Preston's piece by explaining many of his points in detail. [H]e said in the Islamic tradition, God has given His word to Mohammed, but it’s an eternal word. It’s not Mohammed’s word. It’s there for eternity the way it is. There’s no possibility of adapting it or interpreting it, whereas in Christianity, and Judaism, the dynamism’s completely different, that God has worked through His creatures. And so, it is not just the word of God, it’s the word of Isaiah, not just the word of God, but the word of Mark. He’s used His human creatures, and inspired them to speak His word to the world, and therefore by establishing a Church in which he gives authority to His followers to carry on the tradition and interpret it, there’s an inner logic to the Christian Bible, which permits it and requires it to be adapted and applied to new situations ... But Islam is stuck. It’s stuck with a text that cannot be adapted, or even be interpreted properly. The Protestant Reformation and subsequent schools of Christian theology sufficiently purged mainstream Christianity of any authoritative teaching that sought to justify the use of warfare or torture or other violent means as a Biblically sound method of spreading the Gospel of Jesus Christ. The Crusades were over by the beginning of the 14th century. The last heresy trials conducted by the Roman Catholic church that were facilitated through the royal house of Spain took place two hundred years ago. And since that time, the Christian church has voluntarily recused itself from its traditional role as an overseer of Western governments. Until the current situation within the Muslim ummah changes, there can be no Muslim Reformation. "I emphatically declare that today's world more than ever before longs for just and righteous people with love for all humanity, and above all longs for the perfect, righteous human being and the real savior who has been promised to all peoples and who will establish justice, peace and brotherhood on the planet. Oh Almighty God, all men and women are your creatures and you have ordained their guidance and salvation. Bestow upon humanity that thirst for justice, the perfect human being promised to all by you, and make us among his followers among those who strive for his return and his cause." That prayer was uttered yesterday before the General Assembly of the United Nations by Iranian President Mahmoud Ammadinejad. The "real savior" to which he refers is of course the Telfth Imam of Shi'ia Islam. And the return of the Twelfth Imam ushers in Allah's judgment and the end of the world as we know it. To clarify: Ahmadinejad called for the end of the world from the podium of the UN General Assembly. Such rhetoric is not new to Ahmadinejad. Read the speech he delivered at the UN last year. It's a good thing that there is no ACLU chapter in Tehran. Ahmadinejad would drive them nuts. Or have them all beheaded first. Hugh Hewitt noted that President Ahmadinejad's prayer was curiously excluded from all mainstream media coverage. I wonder why they would have chosen to do that? Make us among his followers. 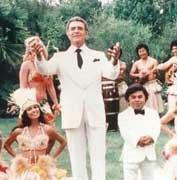 This would be akin to President Bush concluding his speech with an appeal for everyone to follow Jesus. The commentariat would fall off their chairs en masse: he’s outPoped the Pope! But Ahmadinejad, I suspect, will get a pass. Not because his kumbaya blather and deliciously naughty anti-empire rhetoric chubbed up the lads at AP and Reuters, but because he’s seen as a vaguely absurd figure. He says the most colorful things. Nice smile, too! Always good for a quote, that one. There’s something else behind the indifferent reaction, though. Everyone has already accepted the idea of Iranian nukes. I think it’s been factored into our subconscious calculations, where they lie as great red glowing things whose threat is somehow still abstract. They won’t use them. They just want them. The way we all want a big-screen TV, and would keep it in the box once we bought it. I frequently hear people remark that Iran would not be stupid enough to use a nuke, since they know it would bring about retaliation. But MAD only works if the other guy’s SANE. If the Administration regularly made remarks like Ahmadinejad and the other top-tier leaders, critics in the West would have long ago been dissolved in a puddle of corrosive urine. Imagine the President of the United States addressing a group of supporters and leading them in a chant of “Death to Iran.” Imagine what that might mean. ADDED: Scott from Powerline notes that a crowd of thirty five thousand gathered outside the UN to support Israel and protest Ahmadinejad's speech. Didn't read about that in the US mainstream media either, did we? Islam has a problem on its hands. While it may be true that less than 1% of the world's Muslims actually take up arms against "infidels" (for a religion with 1.5 billion followers, that's an army approaching 15 million), the holy men of Islam have remained largely silent with regard to the violence perpetrated by these warriors of Allah. The result? It seems more and more likely that the average Muslim, though he probably would never attack or kill his non-Muslim neighbors, watches the killings, riots, and bombings conducted by his more radical brethren and thinks to himself, I would never do this ... but perhaps these men might have a point. Maybe my faith is just not strong enough. And inevitably, the army of Allah's holy warriors grows. The remarks made this week by Pope Benedict XVI have officially hit the "Muslim street," which as usual is swarming with bearded men heaving rifles in the air, setting fires, and demanding blood. At this point it seems doubtful that most of the rioters have even the slightest clue what the Pope actually said. “The pope’s latest statement cannot be considered a slip of the tongue or a comic bit from a TV show; the situatio0n here is different, and his remarks are indicative of an important and highly symbolic stance toward the religion (Islam) and the prophet of about a billion and-a-half Muslims,” he said. Did Pope Benedict XVI speak of white supremacy? No. He delivered a lengthy scholarly address discussing the influence of Greek thought on the Christian concept of rationality and reason as distinct fundamental traits of the Christian God. As a contrast, he explained that the noted Andalusian philosopher Ibn Hazm described the Muslim Allah as a transcendent supreme being who is "not bound even by his own word, and that nothing would oblige him to reveal the truth to us. Were it God's will, we would even have to practice idolatry." He further contrasted Christianity and Islam by explaining that the rational nature of Christianity eliminates the necessity to use violence or force when asking people to accept Christ's gospel. Benedict XVI quoted another historical figure, the 14th century Byzantine emperor Manual II Paleologus, who remarked, "Show me just what Mohammed brought that was new, and there you will find things only evil and inhuman, such as his command to spread by the sword the faith he preached." "God is not pleased by blood, and not acting reasonably is contrary to God's nature. Faith is born of the soul, not the body. Whoever would lead someone to faith needs the ability to speak well and to reason properly, without violence and threats... To convince a reasonable soul, one does not need a strong arm, or weapons of any kind, or any other means of threatening a person with death..."
This must be a difficult pill for Muslims to swallow, for the past few days have been filled with violent cries for revenge; yet again Muslim leaders failed to deliver any systematically reasoned response to the Pope's actual arguments, instead preferring to let angry mobs answer for them. In a stunning living testimony to the words of a centuries-dead Byzantine emperor, the millions who make up the holy armies of the "Religion of Peace" will march yet again; men pitifully left to their own devices -- murder and subjugation -- by a transcendent Allah who remains largely unknown to them, for their rigorous faith condemns any attempt to question Him. Islam indeed has a problem. Let's hope that Christians and the Pope are not forced to pay for this problem with their lives. Michelle Malkin has another good roundup of commentary and reaction to the Pope's speech, including a good article by Stephen Bainbridge, and a mutilated photo of the Pope that is supposedly being traded among radical Islamic websites. The photo's caption demands the beheading of the Pope and refers to him as a "Swine and servant of the cross, worships a monkey on a cross, hateful evil man, stoned Satan, may Allah curse him, blood-sucking vampire." WizBang has more, too. Without descending to details, such as the difference in treatment accorded to those who have the "Book" and the "infidels", [Byzantine emperor Manuel II Paleologus (1350-1425)] addresses his [Persian] interlocutor with a startling brusqueness on the central question about the relationship between religion and violence in general, saying: "Show me just what Mohammed brought that was new, and there you will find things only evil and inhuman, such as his command to spread by the sword the faith he preached". The emperor, after having expressed himself so forcefully, goes on to explain in detail the reasons why spreading the faith through violence is something unreasonable. Violence is incompatible with the nature of God and the nature of the soul. "God", he says, "is not pleased by blood - and not acting reasonably (....) is contrary to God's nature. Faith is born of the soul, not the body. Whoever would lead someone to faith needs the ability to speak well and to reason properly, without violence and threats... To convince a reasonable soul, one does not need a strong arm, or weapons of any kind, or any other means of threatening a person with death...". In recent weeks I have blogged repeatedly that Christians should shine the light of truth whenever they see evil being passed off as righteousness. Bravo to the Pope for engaging in such an illumination. I even agree with his theology. Warfare is a construct of humanity, not a divinely-sanctioned means of vanquishing evil. Of course the Old Testament gives us detailed accounts of faithful men, acting directly on the instructions of God, who fought and killed those who stood in the way of the establishment of a Holy Land for God's chosen people. But contemporary Christianity understands that these violent acts occurred because God chose to interact with ancient man through the instutitions of man; thus the methods available to him were limited by man's sinful nature. Christianity's God differs from the "Allah" of Islam because Christianity's God ultimately conquered humanity's sin through the process of Jesus Christ's crucifixion, resurrection, and ascension into Heaven. "Doing God's will" no longer requires us to utilize the corrupt systems developed by man, because the peaceable Kingdom brought into being through the blood of Christ completely transcends all earthly power structures. Violence is forbidden by as a tool of Kingdom evangelism both by the teachings of Jesus and the writings of the early church saints. Certainly the ancient Roman church failed in this respect, up through the Protestant Reformation era and then later still in the kingdoms and colonial governments of Spain and France. The Crusades, the Spanish Inquisition, and the brutal conquest of the New World will forever remain as painful reminders of this failure. But the church recovered from this error, and today's modern Christian church, effectively separated from the state, no longer fields armies or declares holy wars. One of the dangers in believing in a completely transcendent God is the risk of assuming that such a God is so detached from humanity that mankind can be left to his own devices when it is convenient for him to do so. Although our sinful nature keeps us from understanding the ultimate perfection of God's love and grace, Christianity explicitly teaches that it is possible for men to be filled with the spirit of God and thus begin to close the gap -- between human nature and the perfect nature of God -- that exists as a result of our sin. This is not transcendence; rather it is intimacy of the highest order. I believe that this basic difference between Christianity and radical Islam should be continually brought to the forefront and explored by Christian thinkers. UPDATE: Are you sitting down? Muslims are outraged. Look for the riots any second now. "Anyone who describes Islam as a religion as intolerant encourages violence," [Pakistani] Foreign Ministry spokeswoman Tasnim Aslam said. Michelle Malkin has a detailed post on this subject, including a great email from a reader that echoes much of what I said above. John Gillmartin has more to say at RedBlueChristian. The demand to “convert or die” is not a thinking demand, it is not born of reason. It is culled forth from a dark heart given over to something larger than a human sense or sensibility. It is an unnatural requirement; it is Supernatural. As such, it can only be properly answered through Supernatural means, through a heart that is not dark but which is equally given over to something larger than our rational and reductive imaginings. Can you reduce the response to a forced conversion into whether one “meant it” or not? Yes, you can, but in doing so you have taken your eyes off of something hugely in play but easy to miss - that the greatest feats of heroism written in the annals of human history have come about through a combination of faith and reason, but with reason bringing up the rear. Others like Michelle Malkin have been sounding the alarm bell about the very real possibility of Islamofascists making forced conversions a new requirement for anyone they capture, or for any group of people who are now harboring Islamofascists in their midst -- hello Lebanon, are you listening? One can't imagine the terror of such a moment unless they experience it. For me, the pain of such an event would be the realization that saying "no" would mean that my wife would have to raise our three children without a husband, and that my precious children would grow up without a father. Yet I couldn't imagine becoming a witness to such an outrageous lie, forced by the barrel of a gun. Here is a call for the endurance and faith of the saints. And I heard a loud voice in heaven, saying, "Now the salvation and the power and the kingdom of our God and the authority of his Christ have come, for the accuser of our brothers has been thrown down, who accuses them day and night before our God. And they have conquered him by the blood of the Lamb and by the word of their testimony, for they loved not their lives even unto death. In The Politics of Jesus, John Howard Yoder writes, "The key to the obedience of God's people is not their effectiveness but their patience ... The relationship between the obedience of God's people and the triumph of God's cause is not a relationship of cause and effect but one of cross and resurrection." Am I urging the West toward martyrdom, here? No, I am not urging it. But I am suggesting throughout history, martyrs have spilled blood and it has made a difference. I am suggesting that down the line some may well be called to martyrdom, and we might be wise to anticipate it and understand its use. I am suggesting that when one is caught in a fight between darkness and light - a fight that is more super than natural - such blood might well be required. It always has been, before. Last week I posted a link to a very good article by Steven Schwartz that provides a comprehensive explanation of "Islamofascism" as well as a good understanding of what fascism in general involves. On Tuesday, Secretary of Defense Donald Rumsfeld gave a blistering speech that compared today's events in the Middle East to Europe in 1939. Liberals and Democrats went nuts, most probably because they feel that they own the copyright to the term "fascist," and that they are the only ones allowed to apply it to their enemies with impunity. Those who have been heavily drinking the moonbat Kool-Aid during the past six years will probably be able to list "examples" of how points 1-3 and 6 "accurately" describe George W. Bush and the legion of angry kook religious fundamentalists who are supposedly trying to turn the USA into a fascist state. To be sure, the "religious right" is upset about WalMart stores asking their employees to stop saying "Merry Christmas." And they are unhappy about attempts to remove "In God We Trust" from US currency, and to remove the Ten Commandments from government property. But there are no Christian brownshirts roaming the streets, terrorizing citizens and intimidating lawmakers. Pat Robertson has yet to issue a proclamation ordering his minions to burn abortion clinics or vandalize the campaign offices of Democrat political candidates. It is also ludicrous to equate political partisanship with fascism. After all, didn't Bill Clinton and Al Gore promise to "reinvent government"? And isn't it fair to say that much of Hillary Clinton's base consists of die-hard Clinton supporters who are dying to see the Clintons become the First Family again? Are they "fascists"? Finally, equating fascism with a direct explanation of the difference between the forces of good (liberal democracy) and the forces of evil (terrorism), and the desire to see good to triumph over evil, is simple-minded sophistry of the highest order. America may have a problem with hegemony, but it is more likely the result of capitalism than of a well-orchestrated diplomatic and military strategy by the Bush administration. And it has been ongoing since the end of World War II. As much as I am not a "warmonger," I still have to agree with Rumsfeld's assessment. We are facing a new kind of fascism in the Middle East. And these fascists are preparing to build nukes. We had better pay attention while there is still time.